Run by the folks behind e5 Bakehouse, we are proud to have e5 Roasthouse running their cafe and coffee roastery at Poplar Union. e5 run their coffee roastery on site, supplying the café with freshly ground coffee everyday. It doesn’t get fresher than that! e5 Roasthouse serve organic breakfast and lunches inspired by flavours from the Mediterranean and Levant regions, including wraps and sandwiches, fresh salads, meze plates and flatbreads. All baked goods are either freshly made onsite or delivered every morning from their sister café, e5 Bakehouse. On most show evenings, e5 Roasthouse café serves selected wines and beers. For smaller events, we roll out our charming Theatre Bar on wheels, serving a selection of snacks & drinks. Live in the Library – Pizza night! e5 Roasthouse are now open every Friday evening with free live music from Poplar Union! Using the in-house wood-fire pizza oven, they’ll be serving up a selection of freshly made sourdough pizzas from 6pm, including vegetarian and vegan options, and craft beer and wine. Why not pre-order when booking your ticket to one of Poplar Union’s Friday night events?! Get a pizza and drink for just £10! e5 continue their mission to support refugees and community events. They provide training and employment to refugees and donate 30% of profits to refugee charities. e5 Bakehouse and the Refugee Council are collaborating to train refugee women to gain skills and confidence to work in the food industry in the UK. During the training programme, the participants will produce a range of bread which is available to buy as part of a subscription service. Late opening every Friday evening, serving freshly made stone-baked pizza! 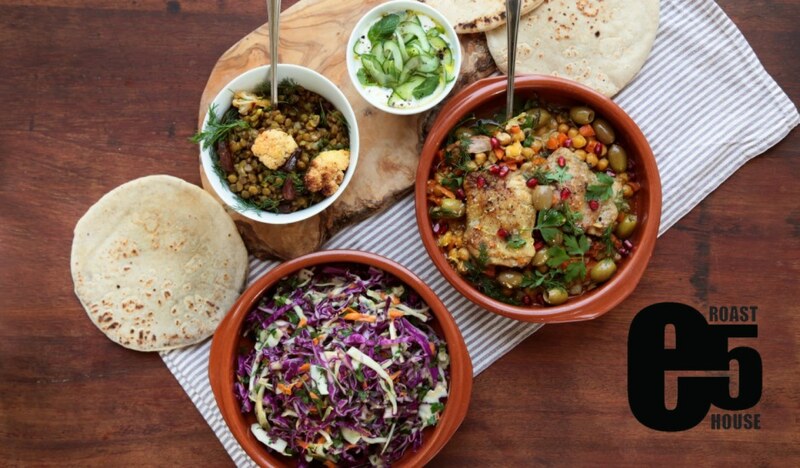 Why not join e5 Roasthouse for their monthly evening workshops to learn how to make sourdough flatbreads and a selection of mezze dishes inspired by traditional recipes from the Middle East.